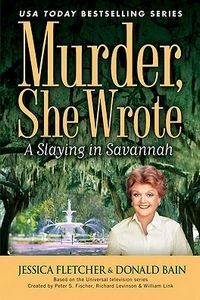 A Slaying in Savannah by Jessica Fletcher and Donald Bain: Synopsis and Online Purchase Options. Synopsis (from the publisher): Jessica Fletcher is saddened when her eccentric old friend Tillie Mortelaine passes away—and surprised to learn that Tillie has left her a million dollars. But there are strings attached. Jessica must use the money to help the literacy fund she and Tillie established years ago in Savannah, Georgia. And she will receive the money only if she can solve a mystery within the month: the murder of Tillie's fiancé, Wanamaker Jones. As Jessica settles into Tillie's Savannah mansion and meets its collection of odd boarders, she discovers that the spirit of the murder victim haunts the grounds. And that there are those in Savannah who are looking to cash in on Jessica's failure.